Before engaging in organized physical activities or sports, participants are almost always required to sign a waiver of liability for insurance purposes. Unfortunately, most of these documents use language that is unclear to the layperson. Frequently, people do not read what they sign; others read the words, but do not understand the content. Almost invariably, regardless of comprehension difficulties, individuals sign such waivers since they are a condition of participation. The content of liability waivers varies. The most common liability waivers are assumption of risk waivers. These state that the participant understands the inherent risks in the activity. By signing an assumption of risk waiver, for example, the participant acknowledges that he or she cannot sue the organizer of a football game for injuries incurred during the normal course of the game. 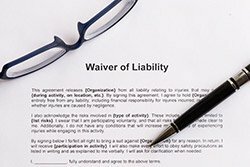 Another common liability waiver uses language about negligence or gross negligence. This covers the organizer of the activity for accidents caused by the organizer’s mistakes. A party acts negligently if he or she fails to observe a standard of care that a reasonable person would follow in similar circumstances. An example of negligence would be the failure to properly secure a harness to a person engaging in rock climbing. Waivers of this type are difficult to enforce. If the language of the waiver is difficult to understand, the waiver will usually fail a challenge in court. A waiver of gross negligence is unenforceable in most of the states in the U.S. Gross negligence occurs when the organizer fails to observe safety measures that even a careless party would normally follow. If the organizer of a dangerous activity fails to provide any safety equipment at all, this is an example of gross negligence. In spite of the fact that waivers under such circumstances will probably not be enforced, certain companies continue to require that they be signed by participants. If a waiver is required to participate in an activity, there is no reason it should not be signed, but there is every reason for the participant to understand what he or she is signing. Individuals should always be aware of the consequences of executing a legal document before signing it. If an injury occurs after a waiver has been signed, only a knowledgeable attorney can advise the client whether the waiver is likely to be enforceable.